A comprehensive look at understanding India with a strategic framework that can be readily used for doing business in this market is needed. 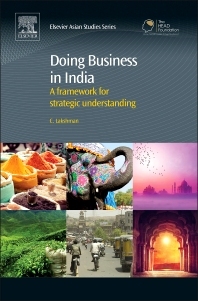 Doing Business in India discusses the cultural and consumer profile of the people of India and how these fit into the macroeconomic context. The analytical framework provided and illustrated with real case examples spans domains such as the institutional context of the country (full of voids and amazing peculiarities) and the interesting federalist political framework in a country with many states. Based on this foundation, the book introduces the business strategies appropriate for both rural and urban markets in India. The following chapters cover the successful implementation of these strategies in India. The remaining chapters focus on successful cross-cultural management of Indian managers and employees, the appropriate types of leadership required for managing the Indian workforce, the types of managerial control systems likely to be successful in this country, and the HRM practices that can help companies to win in this market. Business managers contemplating an entry into India and its markets, Trainers and Management development professionals, Teachers and Students studying courses on successful strategies for emerging markets, especially India. C. Lakshman is currently Professor of International Management at Tongji University, Shanghai, China. Lakshman’s work has appeared in various journals such as Journal of International Business Studies and Journal of Management Studies. His main areas of research interest are leadership, knowledge management, decision making in organizations, Strategic HRM, and Organizational theory.